When it comes to fundraising, the line between success and failure just might be in a box…the Donation Box you choose for filling. Of course, you’ll have more than one involved and that means there are choices to make. Here are the factors to consider for your fundraising success. Strategic location and the quantity of boxes you need for maximum visibility are probably the first areas for consideration. Start with your mapped out area, including local vendors and common areas throughout your communities where you’re partnered for display purposes. Determine foot traffic and how it relates to Donation Box visibility. Don’t overlook the finer details here…OR where each is located when it comes time to collect. Basic, right? Next, how to draw the eye and encourage patron generosity. That’s where size, style, function, and customization make a real difference. You can take a closer look at dimensions in Small and Large Donation Boxes in our catalog and gauge the capacity you need per location accordingly. 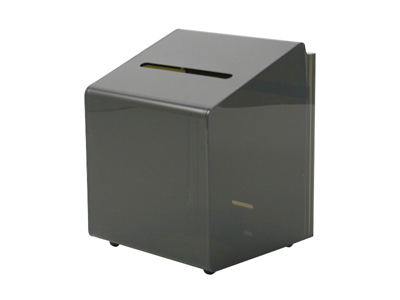 A 6-3/8” Wide Donation Box with a Lock (Style PBS02CS) may be ideal for heavily trafficked areas. Less traffic and smaller counter space? A clear 5-3/8” Coin Box (Style PMBSC5H) could be a better fit. Mixing and matching gives you added flexibility. When acrylic Donation Boxes begin to fill, there’s a natural inclination for others to contribute. But sometimes security has to take precedence. Alternatives like Smoked Acrylic help keep Donation Box contents relatively concealed in areas where theft is most likely to occur…yet the smoky aesthetic appeal helps keep its attractive allure. Think of it as style meeting function: appealing to the eye yet secure, especially Style PBS03CS. 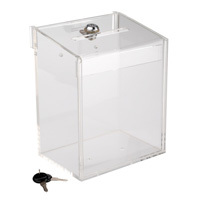 This 6-1/4” Donation Box has a bottom lock that stays out of sight and adds to the security of your campaign. And this leads us to perhaps the most important attraction of your fundraiser: the name, mission, and goal of your cause itself. A hand-written tag and a piece of tape just doesn’t get it. A polished, customized look tells donors they’re giving to a valid, bona fide organization…one where they can feel good knowing that their money’s going where you say it will. Our past work with reputable charitable organizations like Goodwill, the American Heart Association, and the United Way is a prime example. Incorporating your name, logo, and/or slogan with customized acrylic Donation Boxes goes hand-in-hand with success, as has been the case for years with those groups just mentioned. Screen printing directly from your e-file can be applied to Donation Box Headers that stand above the coin box area. 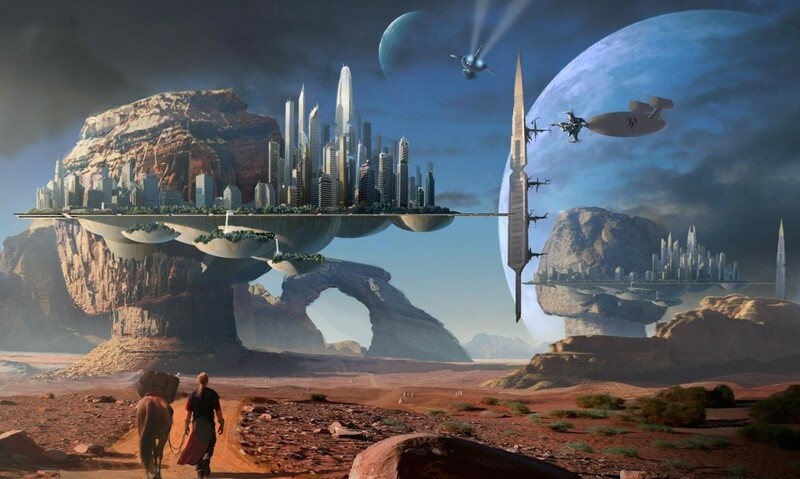 Again, you can get a better idea of dimensions with a quick look. Style PMBSC7H exemplifies a Donation Box with Postcard Header approach and space for 6” x 4” worth of graphics. Or go tall and narrow with a Suggestion Box style and a Header (PBS07H) that gives more of an obelisk appearance. There are several options and the boost to your fundraising appeal will definitely pay off! If you’re organizing a shorter term or limited time campaign, PPM can help guide you to the right section of Donation Boxes. Taking a charity event on the road? 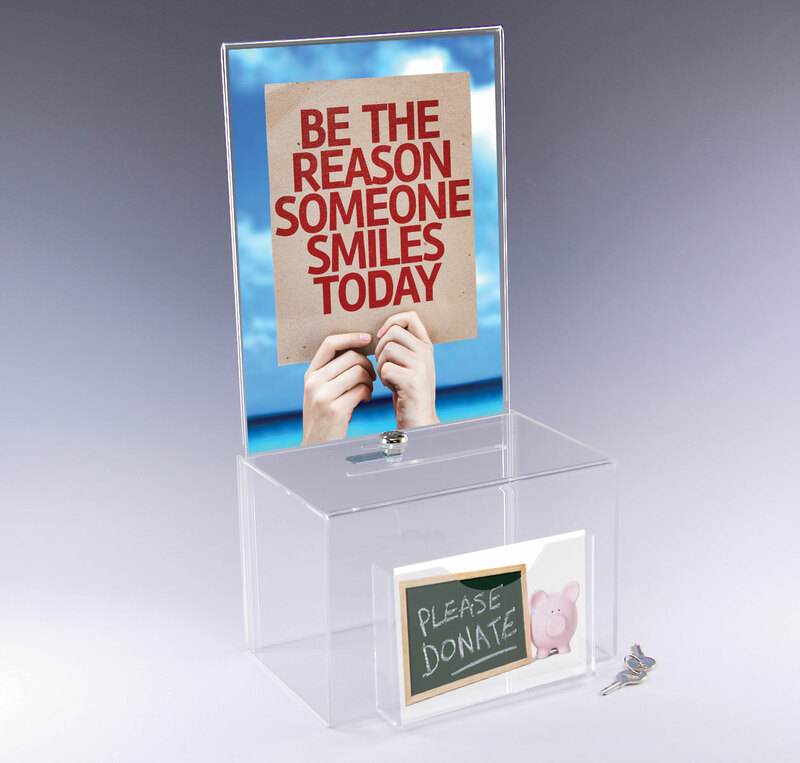 Sturdy acrylic Donation Box styles are geared for mobility. And if you’re more interested in gathering feedback than dollars? Yes, the reliable Donation Box gives you an economical alternative as a Suggestion Box. The results are in! You’ve heard the term Injection Molding, but what exactly is it and what can it do for you? In simple terms, this manufacturing process involves high pressure injection of a molten plastic material into a mold cavity. Once the material solidifies and conforms to the contours of the mold, a sort of blueprint is created for future production runs. That goes for everything from bottle caps, to brochure holders, to pocket combs, musical instrument parts, and auto components. 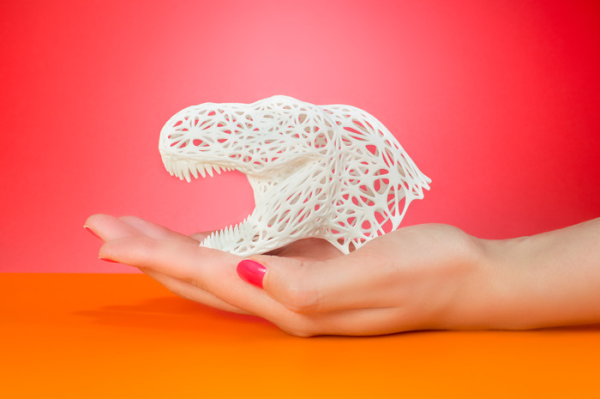 Virtually anything can be injection molded…the sky’s the limit! In more scientific terms, Injection Molding actually traces back to the first condensation polymer in the mid-19th century. It was American inventor John Wesley Hyatt who patented the first Injection Molding machine in 1872. Hyatt’s device was like a large hypodermic needle that injected heated plastic through a heated cylinder into a mold. Hyatt called his resulting compound “celluloid” and it found immediate use in billiard balls and, of course, the motion picture industry. Over the next few years, moldable plastics made leaps and bounds with new developments like Cellophane, Nylon, Polyvinylchloride (or PVC), Teflon, and Polyethylene. It was World War II when the control over speed and quality was tested by huge demand in mass production. The value of injection molding as a manufacturing process took off and never looked back. That same high-capacity capability is also at work now on high volume orders at Plastic Products Mfg (PPM). Our Mexico facility is especially geared for high-volume production runs in various plastic compositions. A type of clamp keeps the injection unit in place while the thermoplastic material is fed into the mold. Intense hydraulic pressure and rapid cooling allows high-quantity runs automatically…and that translates to fast turnaround on both standard and custom plastic products. In PPM’s case, that means a variety of POP Displays can be processes and shipped quickly. It’s the same principle Hyatt introduced, taken to 21st century manufacturing levels with new technology. The molds themselves are typically built with precision CNC machining. Using a form of electrical discharge machining (EDM) has opened the door to more intricate, difficult mold designs and can even be used to shape molds that have already hardened. And once the mold is set, production costs are minimal because the tooling work’s already done. The complete cycle of Injection Molding is also relatively short, from injection of the polymer material through the cooling process…when the mold is opened and the hardened, finished product is “ejected.” Behind the scenes at PPM, the latest chapter in this historical process is in high gear all day, every day! Transformers aren’t just for kids. Thanks to Plastic Products Mfg (PPM), you can transform Sign Holders, Brochure Holders, and Style WF Flush Mount Poster Holders into eye-catching Slat-Wall Displays. It’s all in the Z-Bar. Typically available in standard six-foot lengths, adding extruded Z-Bar to the top/back of Style WF Poster Holders creates the perfect fit in Slat-Wall applications. The Poster Holder stays well-secured and its Acrylic composition is also ideal for light, balanced weight in the overall display once complete. Bonding Acrylic with Z-Bar – or anything else – is best done with a special type of Solvent Cement. Put the glue away and use Weld-On #3 instead, a very fast-setting Solvent Cement specifically formulated for bonding Acrylic. It’s water-thin but don’t let that fool you if you’ve never used Weld-On before. It will adhere extremely fast where Acrylic’s concerned. If your literature/print material is better suited to PPM’s Brochure Holder sizes, a whole new range of Slat-Wall Display opportunities becomes possible. Style PB1200CS is one example of a clear plastic Wall Mount Literature Holder where Z-Bar can be attached. The assembly procedure is basically similar to that of Flush Mount Poster Holders. The difference is in the configuration of Pamphlet Holders on the Slat-Wall. In this case, individual Brochure Holder widths range from 2-5/8” to 12-13/16”. Need variation in depth and/or capacity? Style PB1740CS is one of many Wall Mount Literature Holder that’s popular in Slat-Wall displays. If you need guidance through Brochure Holder styles and how they relate to Slat-Walls, just talk to a PPM Customer Service Representative. That goes for Sign Holders and those Poster Holders we mentioned at the top. Obviously, advance sizing and planning comes first in Slat-Wall configurations before affixing the Z-Bar and making decisions on your preference in acrylic display products. And by the way, X-Bar can also be used and cut to length if that makes assembly easier. PPM Literature Holders are easy to assemble with both Z-Bar and X-Bar for Slat-Wall preparation. Just imagine the possibilities and transform your next in-store campaign! Over the years, the role of plastics in recycling has been hotly debated and often misunderstood. Today, “greener” processes and attitudes alike are opening a new world in plastics recycling…from North America to India and China. Industry and the private sector are both taking a closer look at the subject and developing ways to reduce our collective footprint and create a better future for the environment. In fact, recycled plastics are becoming an increasingly valuable commodity. In 2013, the U.S. alone recycled 3.5 million tons of post-industrial and post-consumer plastics. The latter category is made up largely of items like water bottles, food containers, and shopping bags…traditional plastics collected in blue municipal bins across the nation for years. It’s these post-consumer plastics that contributed about 2/3 of that 2013 total. Engineered and industrial plastics made up the rest. That includes high grade materials found in vinyl siding, PVC pipe, appliances, and cars for example. New technologies are increasing the recyclability of plastic, making more products available for “end of life” recycling than ever before. Acrylic and Styrene are two prime examples of plastics that can be reconstituted into cost-effective, quality products. They’re part of the new generation of plastics that are both ecologically and economically sustainable. Polystyrene, for example, can be recycled up to 20 times without significant loss of its inherent properties and beneficial qualities. And while new Acrylic materials can be a little pricy, recycling it is a very attractive economic option. Recycled Acrylic can also be blended with virgin material to produce lower cost products without sacrificing structural integrity. And where do those recycled plastics go? What kinds of products and uses are finding their way back to consumers? Plastic composite lumber, clothing, carpeting, detergent bottles, and even those recycling bins themselves are just a few. Recyclable plastics are even being exported to manufacturing facilities overseas to meet growing demand for high quality plastic scrap. In 2014, America exported nearly $950 million dollars’ worth of scrap plastic. Recycling plastic also requires 85% less energy than it does to create new plastic, lessening the carbon footprint and reducing production costs. Plastic Products Mfg (PPM) is doing our part to make the world just a little better in this area. Every week, a company comes to pick up our recyclable material. We detest the word “waste” and find weekly pick-up a win-win solution. It not only helps the environment, it supports the global economy, too. It’s never too late to join the fight…climb aboard and give waste plastic new life!